2018 hasn't been a good year for many high street stores in the UK. Carpetright, New Look and Poundland are going through Company Voluntary Arrangement insolvencies, Toys'R'Us and Maplin have gone into administration and, if the latest news is to believed, Homebase's owner Wesfarmer is trying to sell off the DIY chain at a bargain price. The finger of blame has been pointed in so many different directions that it's becoming arthritic. It's because of Brexit, of steep car park charges, of a lack of customer service, the internet, limited innovation, The Beast from the East... Most likely, its current downward trend is as a result of a combination of these factors. And with the news hitting last week that UK pay has outpaced inflation for the first time in more than a year, retailers are no doubt hoping that they're due a bit of a reprieve. But are they? A recent study from ParcelCompare concluded that, if high street sales continue to decline, 50% of all UK stores could close by 2030. Supporting this, figures released in this month's Retail Sales Report from the Office of National Statistics revealed that total sales growth (across all online and offline channels) has experienced a YOY decline of 1.2%. However, the report isn't just a picture of doom, gloom and impending turmoil. It also provides strong evidence that strategic diversification in the digital space is helping some retailers to thrive. 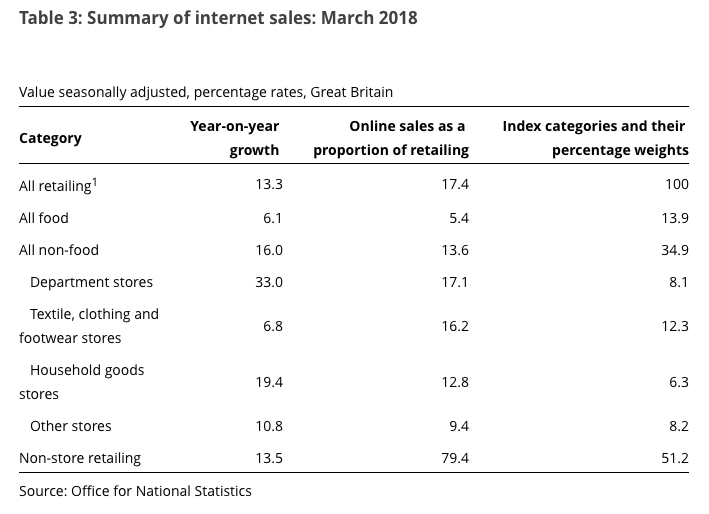 Overall, UK online sales in March 2018 showed a 13.3% YOY growth. While this growth is slower than last year (the same period saw an 18.8% YOY growth), the total percentage of all sales conducted online has increased from 15% in March 2017 to 17.4% this year. See last month's full stats in the table below. Looking at the table, you'll see why diversification matters. Department stores saw an incredibly impressive 33% upturn in YOY online sales last month. In the light of lower footfall on the high street, this upturn shows just how ripe the opportunity for growth there is online.